These Strawberry Lemon Bars are made with sweet red strawberries and Meyer lemons in a rolled oat crust. Beautiful, delicious and almost healthy! Aside from marking the end of the bitter cold winter and the sprouting of green stuff, there’s another reason why I love spring. It’s a transitional season where one season’s produce is winding down and the produce from the next season, first comes to market. Meyer lemon season for example runs from November through April, while strawberry season starts in April and runs through the summer. I love Meyer lemons because they’re one of the few bright flavors you can taste during winter. To stick your nose in a bag full of these golden yellow beauties and take a deep breath, is like inhaling a lungful of pure happiness. Strawberries on the other hand start showing up, just as the weather starts turning really hot, and the sweet red berries stream juicy bliss into your mouth with each bite. .
After a neighbor’s Meyer lemon tree was blown over by an overabundance of fruit and some heavy winds, we found ourselves the lucky recipient of a bag full of fruit. I also found two pints of glorious organic berries at the market and it wasn’t long before thoughts of strawberry Meyer lemonade started coursing through my mind. In the end, I decided to have a bit more fun with the flavors and made these strawberry lemon bars. One of the biggest gripes I have with lemon bars is that they are way too sweet. But when you’re using regular lemons, it’s necessary to add a ton of sugar to offset the acidity of the lemons. The beauty of using Meyer lemons and strawberries, is that they are both sweet and only mildly acidic, so I was able to reduce the amount of sugar in the filling by almost half. I also added some rolled oats to the crust for some texture and fiber. While I don’t think you could ever call a lemon bar healthy, these are certainly “healthier” than your run-of-the-mill lemon bars. 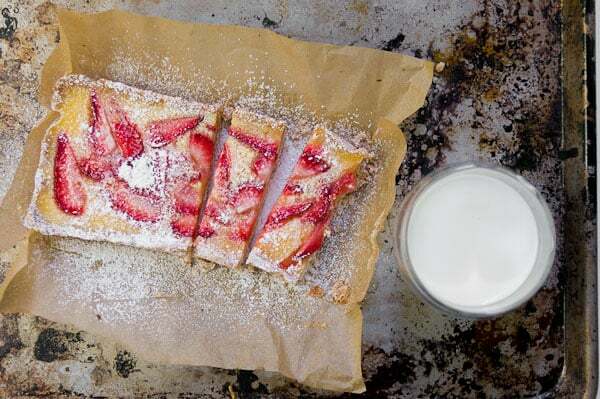 With a buttery crunchy crust underneath, the sweet fruity flavor of the strawberries pairs perfectly with the tart taste and floral aroma of the Meyer lemon juice. As the days grow longer, I’m looking forward to trying this out with other fruits like peaches and wild blueberries! Line a 9" x 13" pan with enough parchment paper to go about 1" up on all sides. In the work bowl of a food processor, add the flour, rolled oats, powdered sugar, salt and vanilla seeds. Pulse a few times to combine, then add the butter and pulse until the dough looks like pea sized gravel (about ten, one second bursts). Sprinkle the dough evenly over the parchment lined sheet and use your fingers to press the dough into a uniform sheet of dough that goes about 1/2" up all the sides. Put it in the freezer for 30 minutes. Meanwhile, place the oven rack in the middle position and preheat the oven to 350 degrees F.
In a small bowl, combine the strawberries and 1/4 cup of sugar and toss to coat. This will release excess moisture and sweeten the strawberries. To prepare the filling, whisk together the eggs, sugar, flour and lemon zest. Add the lemon juice and whisk to combine. Remove the crust from the freezer and put in oven and bake for around 25 minutes, or until it is golden brown and fragrant. 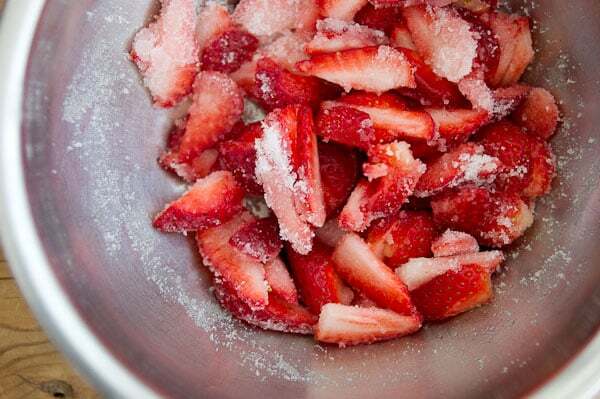 When the crust is done, take it out of the oven, then immediately scatter the strawberries around the crust, pour any accumulated juices into the lemon mixture and whisk to combine. Pour the lemon mixture over the strawberries. Lower the oven temperature to 325 degrees F, then put the pan in the oven and bake for about 20 minutes, or until the center of the lemon bars doesn't jiggle anymore. Remove from the oven and allow them to cool completely. Slice, then dust with powdered sugar and serve. Hi Marc!! Love this recipe – and I love that it looks doable to make. I have to say I have never had a meyer lemon in my life! I hope I can buy them in Chicago! Whole Foods in NYC when they’re in season, so maybe next year? We brought back a ton of Meyer lemons from my in-laws tree. We juice and zested them and froze our bounty for later use. These bars have caught my eye and I think it’s time to pull some of that juice out of the freezer. All afternoon I’ve been torn between making lemon bars and a berry tart. These bars bring the two together perfectly–I don’t have to choose. I just picked up some organic strawberries today and my Meyer lemon tree is still giving me fruit. I have no excuse not to make these. Thanks for the inspiration! 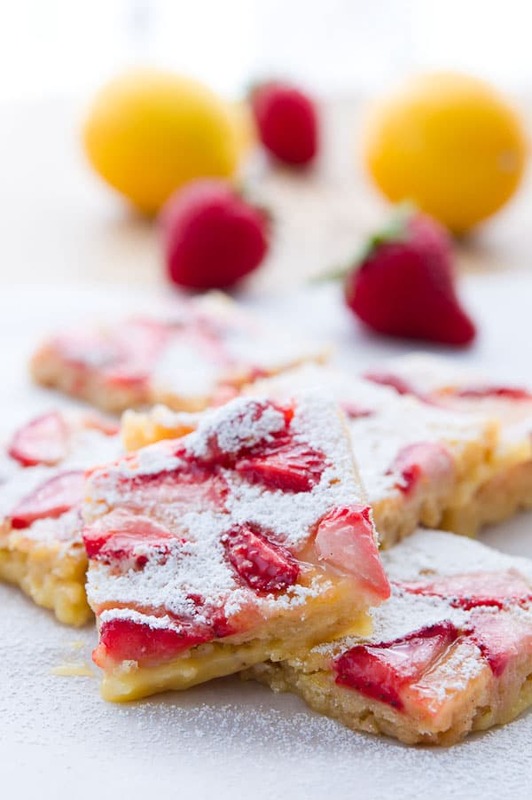 I’ve never had a strawberry lemon bar but I just bought the most beautiful, juicy sweet strawberries – I think I have plenty for this recipe! Beautiful. They look so pretty! And a healthier, not-too-sweet lemon bar? Bring it on! These look amazing! I’m making a lemon dessert for a work party on Tuesday, and these may very well be just the ticket. These look amazing! I have to make a lemony dessert for a work party this coming week, and these might be just the ticket. What a perfect sweet to kick off the summer! I think lemon bars are among my most favorite of all desserts already and last year was the lucky recipient of a box of Meyer lemons from a friend in California. Wish I had some of those today. But…I do have strawberries and I see this in my future. Like today. GREAT idea. I am incredibly lucky to have a friend who has a number of Meyer lemon trees in her back yard. As a result, I am gifted a bag of fresh lemons on a regular basis. As a lover of all things lemony, this suits me just fine! And now I have another way to direct my lemon attention; these bars look delicious with the strawberries. I was just thinking of lemon-strawberry combinations this morning as I picked up fresh strawberries at the farmers market yesterday. Perfect timing for your recipe! I think you just changed my mind on bars. What a gorgeous treat. Mhm, these look tasty Marc! I don’t think I’ve ever had a Meyer lemon? I’m not sure we can get them over here, but I’ll be on the lookout now! Looks and sounds amazing! Thanks for the recipe idea! I have a question for you Marc: if you don’t typically use a pre-existing recipe, then do you follow certain pre-set ratios for your crusts and pastries? love the combination of strawberries and lemon!! That kind of makes me feel better, Marc! I love creating my own recipes, but I have to be much more disciplined with baking than with meat or vegetable dishes. I’ve tried making cakes without a recipe, and I’ve had about the same success rate as you. Now for cakes and pastries, I may change the ingredients but I follow a pre-existing recipe at least for the ratio of egg/liquid/flour. Pat-in-the-pan crusts are a lot more forgiving – not to say I haven’t bungled those, too! OMG! Those are beautiful! Totally saving these and baking them soon!!! This looks amazing! I have some blueberries in the fridge. Mayhap I can do it with those? 🙂 Can’t wait to try it! Would you recommend this recipe if you were unable to find meyer lemons? I live in a tiny town and don’t know when I’ll get around to finding meyer lemons, but I’d really like to try this recipe. Can you suggest alterations using just plain old lemons or would you not recommend it? so I’d probably start by adding an extra 1/2-3/4 cup of sugar. Amazing Idea! I love the combination! Wanted to tell you that i love your blog! Because of the food, and because of the beautiful images…. these look so good. i wish it was meyer lemon season but oh well. i’m going to make these with regular lemons and up the amount of sugar. i love the addition of oats in the crust as well. great recipe. These sound delicious! And I love that there’s less sugar. This looks amazing and I plan on making it but Marc do you have a substitute for vanilla beans? You could just add vanilla extract, or just leave it out altogether. The beans add flavor, but they’re not necessary to have the crust turn out. I’m going to wordpress using thesis. I notice you use it too. Your blog is a favorite of mine. And, the thing that I love the most is the “life” behind your photos. I keep coming back to this one in particular and have “pinned” it for the future. I made this over the weekend. It was prefect! Hi Mark, I have found your blog through Saveur, I believe, and I am absolutely smitten with your approach towards cooking, your versatility with different ingredients, and your love of meyer lemon! I have been looking at so many food blogs in the past few weeks, and none has urged me to leave a ‘wow’ message right away. The Matzo brei idea is nothing short of brilliant, coming from a person whose mother was making some mean mushroom matzo brei for as long as I can remember that’s no small prize. Hi Masha, thanks for the nice comment:-) Mushroom matzo brei sounds awesome! I’m gonna have to try that next time. My 8 year old son called these scrumptious and ordered 3 more! So easy to make and so delicious. I made this, sooo delicious!! I didn’t have meyer lemons so I mixed in some juices from 1 orange… worked great! I made this and it was great!!! did not change one thing. the recipe worked out great, had a bag of meyer lemons and was looking for something good to use them on I sure am glad I found your recipe. Thank you so much you made me look so good at the bbq.. thank you, this is my all time fav……..
Sooooo good. I didn’t have any vanilla beans so I just added a little (1tsp) vanilla extract into the mix. I did end up using at least 1 cup or even 1 1/4 cup strawberries since the top looked pretty bare when I spread out all my slices. Everyone was so impressed with “my” abilities. Thanks Marc! Thanks fo all great recipes! I love making them. I have a question about the crust: should I slightly press the crust with my fingers to form a rectangle (without worrying about how homogenous the mixture is) or making a dough out of the mixed ingredient with my fingers ( completely mixed) and then form it to a rectangle? Hi Mahda, you need to process the butter and other ingredients until they form pea-size gravel. You still want small pieces of butter, but no big chunks. Then you press the gravel together in the pan. It’s not going to be 100% homogenous, but that’s what give the crust its flakiness. do you think I could make them in advance and freeze them for a party a couple of weeks later? Hi Marina, I’ve never tried it so I can’t say for sure, it’s possible the higher moisture content of these bars (due to the strawberries), could make the crusty soggy when you defrost it. Also, you’ll want to wait to sprinkle on the powdered sugar until after the bars have defrosted and come to room temperature. If you do try freezing them, it would be great if you could leave a followup comment to let us know how it goes. Thanks for the nice note, I hope your daughter enjoyed them! I made these last year for the first time and we all loved them. I’m fortunate enough to have found a local source of Meyer lemons that are bigger and juicier than the grocery store variety and cannot wait to enjoy these bars again. Thank you for the wonderful recipe and foolproof directions. These are very good. I was looking for a recipe for strawberry lemon bars and this is exactly what I wanted. It is not too sweet. My tree is a regular lemon tree but the flavor is wonderful. My friend’s Meyer Lemon tree did not produce this year in Arizona, but the others had great crops. Thanks for the recipe.